Editor's Note: Following IDA's Getting Real '16 conference, filmmakers Grace Lee and Marcia Smith approached us about publishing their respective keynote addresses in this issue. And then came The Election, which prompted both writers to reassess their speeches in this new dystopian world. But we decided to keep the speeches as they are—as self-contained calls for action that were just as powerful in September as they are now—and reinforce their combined urgency with introductions from each of the authors. In this post-election moment, we need more than ever to "get real" about who tells the story of America moving forward. To quote Marcia Smith's stirring keynote from Getting Real '16, diverse perspectives aren't something we need out of fairness or charity but because without them, the country will unravel. As an unapologetically white supremacist administration prepares to take the reins of power, it's imperative that we listen to and uplift the voices of the most vulnerable among us if we want the American experiment in democracy to continue. With President-elect Trump lashing out at everyone from Mexicans to Muslim Americans to undocumented immigrants to #BlackLivesMatter to journalists to artists, our only option is to organize collectively in opposition to a president who actively wants to silence us. The inclusion of diverse voices in media is on all of us—and it is the responsibility of our field's gatekeepers and decision-makers to lead the way. At the 2014 Getting Real Conference, I decided to attend the one "diversity" panel, which featured filmmakers and executives of color from the PBS ecosystem. I was shocked at how poorly attended it was, but I was not surprised that "diversity" was programmed as a sidebar conversation. I saw several of my white colleagues actively avoid attending it (yes, I asked if they were going), while assuring me that they were attending the program on gender instead. As a woman of color, having to straddle this choice has been a familiar practice—one that I've too easily accepted as normal. The panel was actually a great discussion but I kept thinking about the absence of people who needed to hear it the most. During the post-election critiques of our self-imposed echo chambers and silos, I was reminded of that feeling once again. That same feeling is what motivated me to help organize the Asian American filmmakers gathering at Getting Real '16, and it also laid the groundwork for my opening keynote. More than 60 people showed up—from Academy Award-winning producers to recent college graduates searching for an entry point into this world. At that meeting, we heard a lot of frustration about the documentary world we inhabit, but also a real energy and desire to change it. In the days afterward, we created an Asian American Documentary Network, and we plan to continue the conversations and organizing over the next year—with formal events planned at CAAMFest in March and in the fall at the Ford Foundation, with more informal gatherings planned in between. This is not unlike the thousands of spontaneous meet-ups and networks that have been organizing after the election. At our convening, there was a real sense that we needed to actively seize our future. But we had no idea that November 8 would so violently disrupt what we thought was a steady trajectory towards a majority-minority destiny. From 11/9 moving forward, all of us have to rethink and reclaim what "identity politics" means and recognize, to paraphrase Marcia Smith quoting Stanley Nelson, that our future is unstoppable. This election was a backlash moment for communities of color, but the principles of why we organize and why we recognize the people who paved the way for us, remains constant. What Time Is It on the Clock of the Documentary World? Good morning. It's great to see everyone, and I want to thank the IDA— especially Simon Kilmurry and Ken Jacobson—for inviting me to share a few words to kick off the conference. I also want to give a special shout-out to Marj Safinia and everyone on the IDA Board, staff, volunteers and my fellow filmmakers. Thank you for organizing this opportunity for all of us to get real about the documentary field. Some of you know me through the film I made a couple of years ago called American Revolutionary: The Evolution of Grace Lee Boggs. For those of you who are not familiar with Grace Lee Boggs, she was a Chinese American writer and philosopher who spent seven decades rooted in radical grassroots activism—primarily in the Black community of Detroit. Grace died last year at the age of 100 years and 100 days. Yes, she kept it 100 until the very end, by daring to ask the big questions facing us as a society and as individuals. To summon the spirit of Grace Lee Boggs, I'd like to put forth a question that she would often use to open a meeting: "What time is it on the clock of the world?" I'd like to modify Grace's question a bit and ask, "What time is it on the clock of the documentary world? And will these two clocks ever be in sync?" Getting Real's themes this year are Art, Sustainability and Diversity. I want to talk about these themes through the lens of being an Asian American storyteller who makes work about Asian Americans. Not Asians on the continent of Asia, but Asian people living here in the United States—who, let's face it, are still largely invisible when it comes to political, social and cultural representation. It's worth reminding you that we're in Los Angeles—a city that is 60 percent Latino and Asian, but most of the media continues to talk about race, politics and culture in largely Black and White terms. I barely blink an eye when these dynamics extend to the documentary world; that's how ingrained our invisibility is. I know there are colleagues out there who don't want to be labeled by identity. They say, "I am a filmmaker who just happens to be Asian American." Or , "Don't call me a woman director. I'm a director, period." Or, "I'm a producer who happens to make feature narrative films alongside my documentaries." I get it. I've actually said all of those sentences at different points in my career. I even made a film called The Grace Lee Project, about my fear of being pigeonholed, thanks to my incredibly common Asian- American name. But on my clock of the documentary world, where the #DocsSoWhite alarm seems to be sounding every hour, I want to talk about Asian Americans. Mostly because we never do. Twenty-four hours ago, I was in Taiwan, teaching a master class at CNEX, which stands for China Next, a documentary forum where Chinese filmmakers (from the mainland, Taiwan and Hong Kong) come together for several days to hone pitches for their films and meet broadcasters, sales agents and festival representatives from around the world. Just imagine something like the Hot Docs or IDFA Forum, except all of the participants and most of the decision-makers are Chinese. In other words, I saw the future. Have you all started learning Mandarin yet? By the way, in the future, the food is way, way better. Just for the record, I'm Korean American—and I don't speak Chinese. But it was pretty awesome being in Asia, where I at least look like, and people assume I'm part of, the majority. It was especially revealing to watch my Asian-American colleagues Jean Tsien, Leo Chiang and Yung Chang (even though he's Canadian) function in this world. In Taiwan, they were the experts, the bridge between the "Western" decision-makers and the "Chinese" filmmakers. Jean, Leo and Yung were were translating for the rest of us "foreign guests," extending the language privilege and social capital they had to all of us. Even though Leo and I have been friends for a while, I saw him in a completely new light over there. The confidence and authority with which he led us around the conference and in his hometown of Taipei is something that comes with the position of being the host. And lucky for us, he was an extremely generous one. My experience these last few days made me think about growing up in my hometown of Columbia, Missouri, where my parents and I were constantly looked upon as guests by my teachers, my friends' parents and random strangers. I'm not going to lie. It got tedious being asked how I spoke English so well, even though I was born and raised in the Show Me State, just like them. I don't harbor any ill will with those folks because back then, being Asian meant being a foreigner—an immigrant with broken English. That's just what you saw on the news and TV, if you saw Asians at all. But has our understanding of Asian America really gotten much better since then? Columbia now has the wonderful True/False Film Festival but how many Asian American stories have been programmed there—or in other US documentary film festivals, or on television or in the digital space—in the last decade? And if a documentary with Asian American content or characters happens to break through the public consciousness, how often are the directors of these stories Asian American? Ironically, Hollywood is doing a much better job at green-lighting and putting Asian American stories on network TV, cable and on series like the Emmy Award- winning Master of None. If Fox, ABC and Netflix can successfully create these primetime series, it means there is an audience out there for this content. So why is the nonfiction world lagging behind? I bring up these anecdotes because I can't get real about the documentary world, unless I admit that I'm ambivalent about my place in it. As a filmmaker who's also a second-generation daughter of immigrants, a woman, an Angeleno with Midwestern roots, a mother, as someone who makes fiction films too, it's impossible for me to separate art, sustainability and diversity from one another. These interconnections inspire a lot of questions—like, Who belongs to the doc community? Who gets to thrive here? How do you thrive? What kind of work can you make that challenges you as an artist, yet is still fundable? Whose stories matter? And as I look out at you all, I also think about who is missing from this room to help us get real: What about the people who have day jobs working on reality TV so they can support their own projects on nights and weekends? Or the people who can't afford the registration fee to attend this conference? Or the people who don't even know the IDA exists as a resource for them? I have a confession to make. I used to be one of those people, until about four years ago when I was finishing American Revolutionary. I had never been to an IDA event, even though I've lived in Los Angeles since 1997. And it's not like I was just starting out. I was a successful graduate of UCLA Film School. . I had two feature-length films and a couple of doc shorts under my belt, but it never occurred to me that the IDA was for me. In fact, the first time I actually attended an IDA event was the 2012 IDA Awards, when Simon Kilmurry, who was still at POV, invited me as his guest. The next year, my friend Laura Nix gave me her ticket to the Awards—and that's when I saw Marjan Safinia, IDA's board president, on stage. Marj: a badass producer, a woman, a person of color, an immigrant. Her leadership and her presence made it clear that it was OK for me to be here. I mention this story because it matters who we see in this world, who we invite to be here to represent our community, including on this very stage. Are we hosts or are we guests? Have you all read Renee Tajima-Peña's personal essay on #DocsSoWhite in Documentary magazine? It's an excellent read. In the article, she namechecks a lot of organizations and people—many of whom are Asian American—who are directly responsible for me being here today. New York's Third World Newsreel Production Workshop, taught by Herman Lew and JT Takagi, was my very first film class. Renee also mentions Loni Ding, the godmother of Asian American documentary. I met Loni through JT, who had called Newsreel, asking if there was anyone who might help her field-produce some shoots in New York's Chinatown—and I jumped at the chance. Eventually, Loni asked me to move to San Francisco to work with her as an associate producer on a film about early Asian immigration to the Americas. Born and raised in San Francisco, Loni had gone to UC Berkeley, where she had abandoned a PhD in sociology to protest the Vietnam War and become a community organizer in Chinatown. Through an internal diversity program, she got access to KQED and began creating community-based media like English-language lessons for Chinese immigrants, and a groundbreaking children's series set in Chinatown. Her films on Nisei soldiers who enlisted to fight in World War II were shown in Congress during the campaign to gain reparations for Japanese Americans who were locked up in government concentration camps. Loni also taught a documentary class in the Ethnic Studies department at Berkeley, was the mother of two kids, and yet also found the time to advocate for the doc community as a whole. In 1980, she organized a gathering of Asian American filmmakers at UC Berkeley that laid the groundwork to create what is now the Center for Asian American Media (CAAM). She also played a leading role in creating ITVS. I learned so much watching Loni from behind the scenes. I saw how it was a constant struggle to prove that Asian American stories were worthy of funding, distribution and attention. I remember hearing about the time when Bill Moyers decide to produce a limited art series on the Chinese in America, and watching a prominent Chinese American organization leap at the chance to fund it. This was support that had eluded Loni on her own series on Chinese Americans. I don't blame that group for jumping all over Bill Moyers, but it was disheartening to see, as a young woman eager to tell our community's stories. A variation of that theme exists today, where the mandate for diverse content means there's a lot more demand for stories about communities of color. But the practice of pairing a veteran white producer with an associate producer, editor or other person of color on your team is not the same as supporting diverse perspectives or leadership. Beyond being able to sustain a career in documentaries, Asian American filmmakers, including myself, are often told that our stories aren't urgent or too niche to crossover to a national audience. But how do you define audience, and how do you define niche? Would it surprise you to know that the fastest growing group of undocumented immigrants in the United States are Asian? Or, remember Khizr Khan, the father of the fallen soldier who challenged Donald Trump to read his copy of the Constitution? We all know that Khan, his wife and his son are Muslim American, but he's also an Asian American, originally from Pakistan. And what about all the anti-affirmative action lawsuits taking place, where Asians are pitted against Blacks and Latinos as the "model minority victims" of race-based admissions policies? Our Asian American stories are everywhere. They are contemporary, full of drama, conflict, often transnational in scope…and are barely making a dent in the nonfiction storytelling world. It's no wonder I see a lot of Asian American producers shifting toward telling international stories based in Asia—but that takes a lot more resources than the stories that affect our communities on a daily basis. I personally would love to shoot a documentary in Korea, but there's an equally compelling story to be told in Koreatown, LA, which is just outside my door. So where do we go from here? One of the reasons I'm talking about all of this today is because I don't want to be having this same conversation in 10 years—which is why some of you may have noticed we're having an Asian American filmmakers gathering today at lunch. It really just started out as conversations between me, Leo, Renee, Chi-hui Yang and the folks at CAAM. We just wanted to expand the conversation to include all of you, and the IDA stepped up. The process of actually organizing the lunch has already been empowering—and we haven't even met yet. At least 50 people have RSVP'd, many of whom are coming to the IDA for the first time, because of this gathering. Because we invited them. 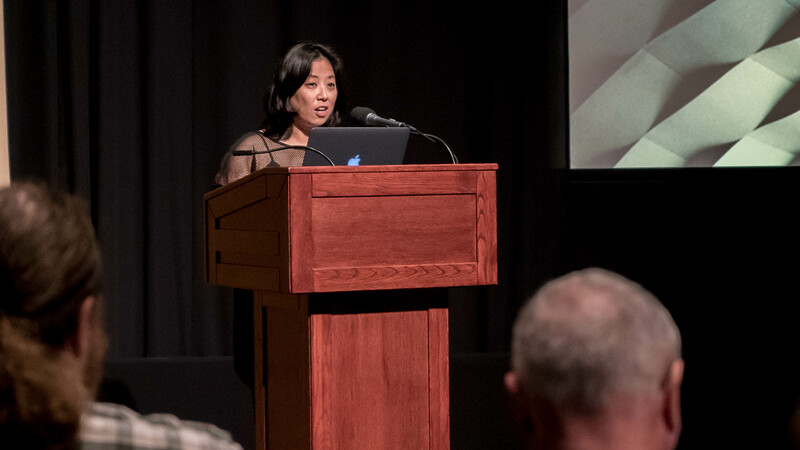 The last time any gathering specifically geared toward Asian American doc filmmakers happened was in 1980—the meeting that Loni Ding organized that led to the creation of CAAM. There's another quote from Grace Lee Boggs that has always inspired me. She talks about staying in one place, Detroit, for so many years. And she says, "I learned to love Detroit when I realized I had to become responsible for it." I think the same applies to the Asian American community in the nonfiction world. My ambivalence about my place in it has evolved toward a commitment to wanting to change it. Instead of venting about the problems, it's much more exciting to organize. To paraphrase Grace, I learned to love the documentary world when I realized I was responsible for it. We are actually all responsible for it. Finally, as we kick off three days of intense, reflective conversations that will hopefully move this community forward as a whole, here's one more reminder to be generous with your invitations. Talk to people you normally wouldn't have. Go to a panel you don't think applies to you. Reach out to that person sitting next to you whom you haven't met yet. Remember what time it is on the clock of the world and on the clock of the documentary world. And have a great time doing it. Grace Lee is a Los Angeles-based filmmaker whose credits include American Revolutionary: The Evolution of Grace Lee Boggs, Off the Menu: Asian America and Janeane from Des Moines.